System Mechanic 18 Premium is an extremely comprehensive maintenance suite that provides just about everything you could ever need to clean, repair, optimise, and generally get the most from your PC. There are plenty of tools around that make similar promises, of course, but this isn't just another copycat speedup suite. System Mechanic delivers far more than you'll get from most of the competition, and so makes it far easier to optimise every area of your PC. For example, System Mechanic doesn't just list your Windows Startup programs and leave you to decide what should be removed. It actually detects malicious or unnecessary startup files, and removes them at a click. The program can also reveal redundant programs that you may be able to install (multiple PDF readers, media players or photo managers, say). And it's able to turn off unneeded background programs at a click, freeing up valuable system resources and speeding up your PC. So even the most cluttered system should quickly see a performance boost. System Mechanic is equally thorough elsewhere. It doesn't just clean and repair Registry problems, for instance: the program can also defragment and compact the Registry to save RAM, then create regular Registry backups to protect your settings. And while System Mechanic's drive-related tools include the usual options to free up space by deleting leftover temporary files, it can do so much more, with tools to monitor your hard drive temperature, defragment your system to improve speeds, find and delete wasteful duplicate files, repair drive problems, and even get an unbootable PC working again. There are more essential features, everywhere you look: whether you want to speed up your internet connection, improve your PCs security, repair an unstable PC or free up a little more RAM, System Mechanic probably a tool that can help. And, perhaps best of all, you have complete control over how these are run. So experts can run each tool individually, allowing them to check everything the program does. If you're short on time you can run an all-in-one tool like the PC Accelerator, which applies multiple tools at once. 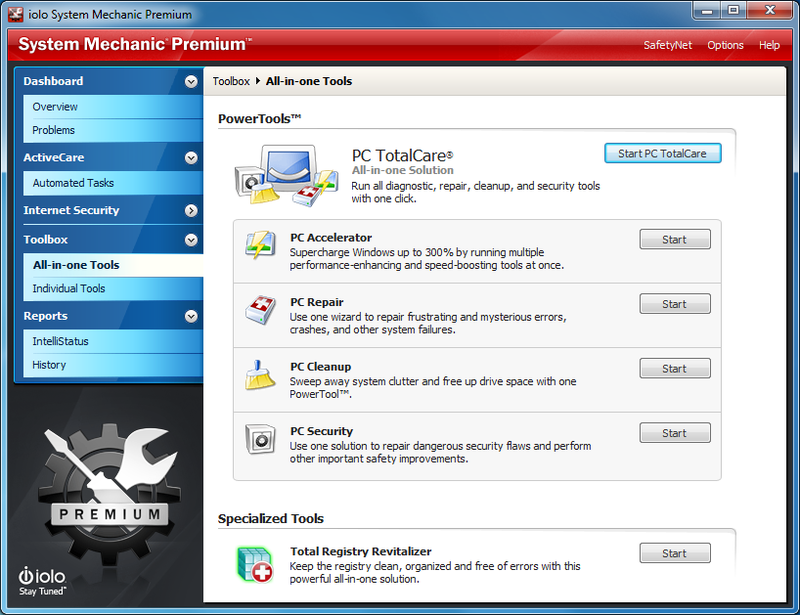 And System Mechanic's PC TotalCare feature will run all the suite's diagnostic, repair, cleanup and security tools fully automatically at a click, leaving you to get on with other things. 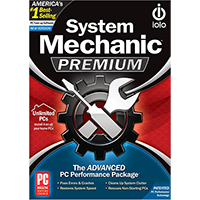 Just in case that's not enough, this Premium version of System Mechanic also includes two very useful additional bundled commercial programs. iolo DriveScrubber can securely wipe the free space, or the entire contents of a hard drive, so you can be sure that no personal data will be recoverable. And an option to create a DriveScrubber boot CD means it's even possible to wipe your system drive, perfect if you're about to sell a computer and don't want the next owner to have access to any of your files. And iolo's Search and Recover is one of the best undelete tools around. It can search hard drives, cameras, memory cards and more to find and recover lost documents, photos, videos, music, even accidentally deleted emails. And unlike many similar programs, Search and Recover will intelligently remove irrelevant junk files from its list of recoverable documents, making it much easier to locate and restore your lost data. Note that the download file here is a (503Kb) stub which downloads the very latest version from the iolo website.